Georgiana W. Stocks | Fafinski Mark & Johnson, P.A. Georgie Stocks is the Business Development & Marketing Manager at FMJ where she drives the firm’s business development, marketing, and public relations initiatives. Prior to joining FMJ, Georgie worked in marketing at a global intellectual property and commercial litigation law firm. In this role, she assisted 200+ litigators with their marketing and business development initiatives and led the execution of the firm’s local and national events. 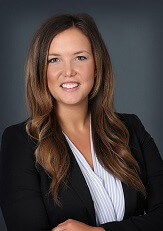 Georgie started her career in public relations after graduating from law school in 2013. She excels at communicating and collaborating with attorneys, which in turn, has been one of the most rewarding elements of her career. Georgie grew up in Edina and lives in St. Louis Park. In her spare time, she enjoys watching the Minnesota Vikings win, high-intensity workouts at Orangetheory, and spending time with her family.